German Expressionism is one of the most exciting and fascinating movements of Modern Art, and is generally described as an avant-garde cultural movement taking place in Europe during the first three decades of the 20th century. It has been defined as a view of the world strictly in subjective, emotional terms rather than as objective reality. In that respect, Expressionism can be seen as the direct opposite of Impressionism, which chooses to view the world in a more positive light. Expressionism eventually extended itself to a wide range of artistic media, including architecture, theater, literature, dance, music, film and, most notably, painting. It was said to reflect the angst brought about by the dehumanizing effects that industrialization was bringing to the world, including the unbridled growth of cities occurring in Germany. Many people were upset by the changes that were occurring in their daily lives and this was being reflected in the art. Simply put, Expressionism sought to portray subjective reactions and emotions aroused within people in response to what was happening rather than objective reality. Such art has often come on the scene during times of social unrest and upheaval. The founding of the Expressionist Movement is thought to have occurred in 1905 when Ernst Kirchner and three other artists formed Die Brücke, which stands for The Bridge, in Dresden, Germany. They openly rejected the current social conventions of the bourgeois and academic traditions as applied to art. Six years later, in Munich, several others formed Der Blaue Reiter, The Blue Rider, named after a 1903 painting by influential Russian-born painter Wassily Kandinsky, then living in Munich. Elsewhere in the art world during the first part of the 20th century, Picasso completed his famous Desmoiselles d' Avignon, Henri Matisse published "Notes of a Painter," which argued for the primal need for "expression" in painting and Kandinsky started composing his first stage work, which combined sound, color and movement. Although we don't have a copy of "Der Blaue Reiter" by Kandinsky, you will find one of his called "Drei Reiter in Rot, Blau und Schwarz," or Three Riders in Red, Blue and Black. This is an original, color woodcut from 1949, and the second printing of this piece. The first printing was done in 1911. It's printed on Lana wove paper, measures 8 5/8" X 8 11/16" and has been signed in the block. 300 were produced for this edition. 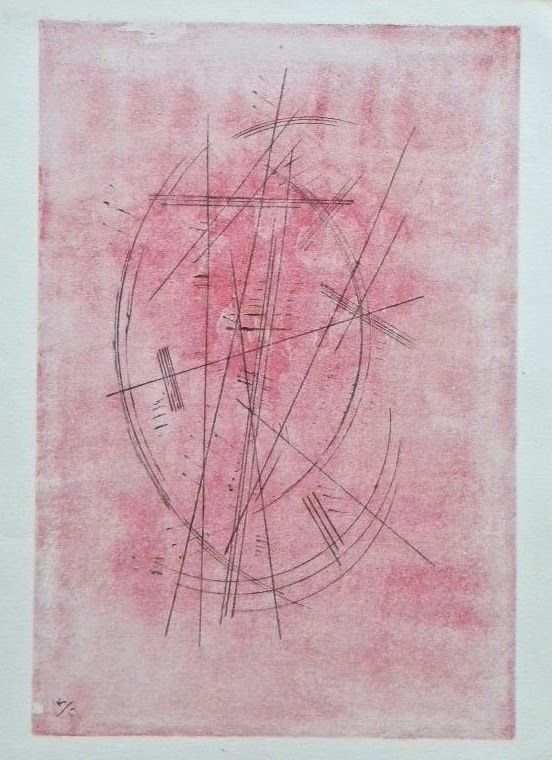 A uniquely subtle Kandinsky print that rarely comes up for sale is called "Watercolor in Rose." This is a pochoir (after the watercolor) measuring 12" X 9 1/4", including margins. 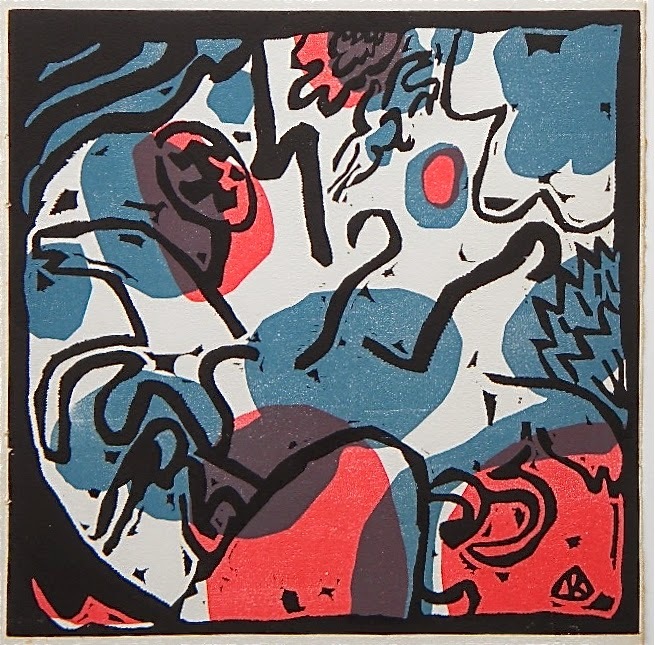 It was printed in 1952, signed in the plate, not by hand, and contains Kandinsky's monogram. It's a beautiful piece and quite unusual when compared to others from this artist.